This tapestry shows Neuschwanstein Castle in all its glory among the bright fall colors of the surrounding forest. Known for its romanticism of design and beauty of its surrounding mountains, this castle was commissioned by Ludwig II of Bavaria and built from 1869 and the King was able to move in by 1874. The castle is distinctive in its architecture in that it has a theatrical appeal and beauty that is exceptional and reflects the fact that this castle was built as a homage to the operas of Wagner. The gorgeous details of the exterior is evident and is the inspiration behind the design of Disney's castles. The interiors, where they have been completed, are highly detailed and elegant rooms dedicated to aspects of Wagner's works. Here in this tapestry we see the gatehouse with a red facade which leads to the courtyard within. The tallest tower is 35 meters tall and provides an expansive view of the Alpine forests and mountains. To the west we see Schwansee or Swan Lake. 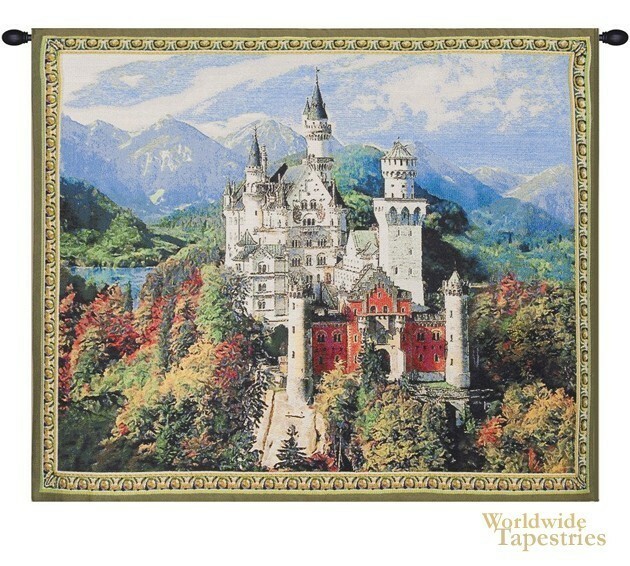 This castle tapestry "Neuschwanstein Castle II" is backed with a lining and has a tunnel for easy hanging. Note: tapestry rod and tassels, where pictured, are purchased separately. Dimensions: W 37" x H 30"